The original intent of this groundbreaking development, produced by important architects, is still alive, however. Avion Village continues to be a wonderful and affordable place for families to live—75 years later. 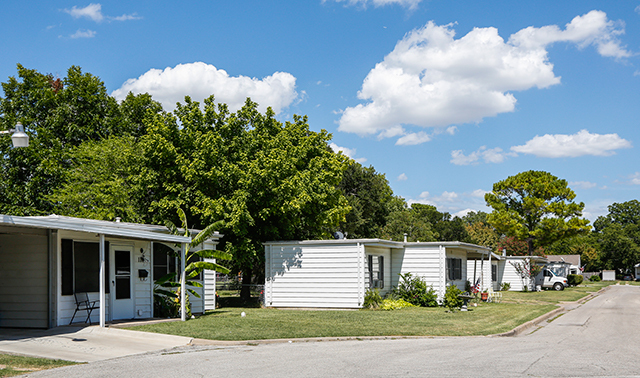 In Grand Prairie, there is a most unique housing development designed by three architects who played an important part in World War II efforts. The 300-unit development, Avion Village, opened in 1941 as part of a massive project to build 21,000 units of worker housing in proximity to critical defense industry sites across the country. A lack of affordable housing for factory workers was a major issue as war efforts were ramping up and the situation provided the federal government with an opportunity to experiment in planning and architecture. 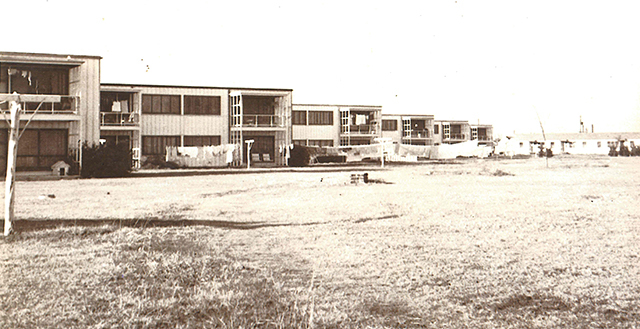 Prefabrication and mass production building techniques were also used in an effort to lower the cost of quality housing. The Division of Defense Housing of the Federal Works Agency, which was in charge of the project, commissioned well-known architects to design the housing developments. An early image of the Avion Village apartments shows the original design with expanses of windows and porches opening up onto the pedestrian greenway leading to the park. The basis for the development was the Garden City planning concept: residential structures built on small lots that opened up to large common areas, creating a park-like setting for residents to enjoy. 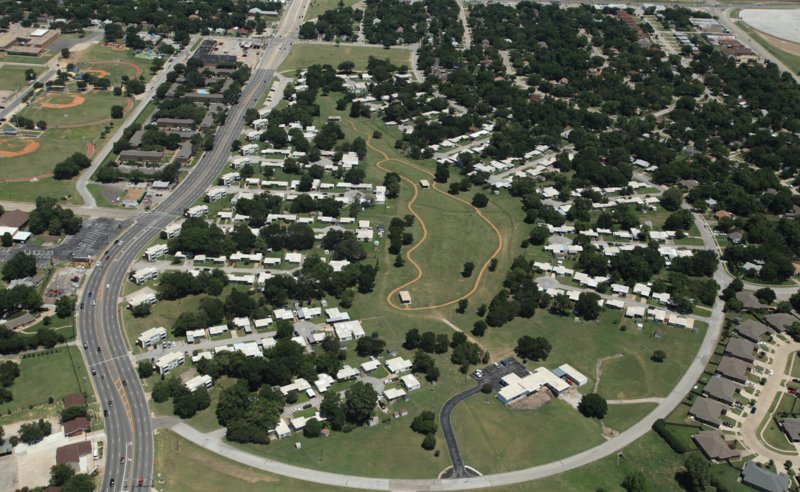 In the case of Avion, the design featured a large central open park area with a ring of residential streets that terminated in cul-de-sacs at the edge of the park area. The layout of the development also facilitated the exceedingly quick construction of all 300 units in 100 days. The community center was built first so it could serve as the offices for the architect and contractors during the construction. Equipment and materials for fabrication of the building components were located in large circus tents erected in the open park area. Rails were laid from the tents out onto the construction site and push trucks were used to deliver the prefabricated sections of the houses. The houses in Avion Village were grouped on small cul-de-sacs with easy access to the central park through a pedestrian greenway. Even though they have been altered with new siding, windows, and carports, the overall form and intent remains. The housing built for Avion included one-story houses, built mostly as duplexes, and two-story apartments with four units each. Each housing unit contained a living room, dining room, two bedrooms, a bath, and a kitchen. The houses were designed in a simple modern style with flat roofs, wood siding, and devoid of ornamentation. Large windows were employed with large glass doors opening up onto patios to maximize airflow. They were also designed to face a small pedestrian greenway leading to the central park. The rear was only used to access parking and the street in true Garden City fashion. The apartments were all constructed on the development’s western edge using the same design features as the houses with the exception of brick veneer end walls and projecting covered porches for each unit. To promote the new development, Williams came up with the idea of a “house race” which pitted two teams of workers against each other to see which could construct a prefabricated house the fastest. The press and nearby mayors and townsfolk were invited to the race to witness firsthand which team would prevail. The winning team finished in an incredible 57 minutes and 58 seconds and two minutes later a “model” family moved in, cooking in the kitchen while a young lady enjoyed a bath. 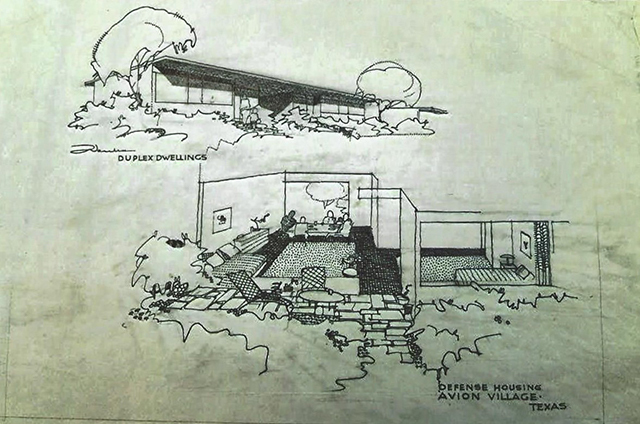 Sketches from the architect show the design concept for the duplexes and how the flat overhanging roofs were intended to shade the large window openings from the Texas sun. The cut-away of the interior shows the openness of the interior and how it relates to the outside. In 1948, the federal government sold the development to Avion Village Mutual Housing Corporation, and it continues to be mutually owned by residents. The design of the houses has been altered over the years with the addition of new siding, replacement of windows and doors, and addition of carports and porches. The original intent of this groundbreaking development, produced by important architects, is still alive, however. Avion Village continues to be a wonderful and affordable place for families to live—75 years later.